I was surfing the web the other day at work. I came across an article from the (Pittsburgh) Post-Gazette that made a reference to Steve's Three Brothers Restaurant (17820 W. Warren Avenue - (313) 271-1227). Two of their reporters, Jeff Ivey and Rich Rudek, were in town for Super Bowl XL this past February. Jeff and Rich wrote an article about their experiences in Detroit that week - including a stop at Steve's Three Brothers. They refered to it as "the greatest breakfast of our lives." Quite frankly, I was flabbergasted when I read that. 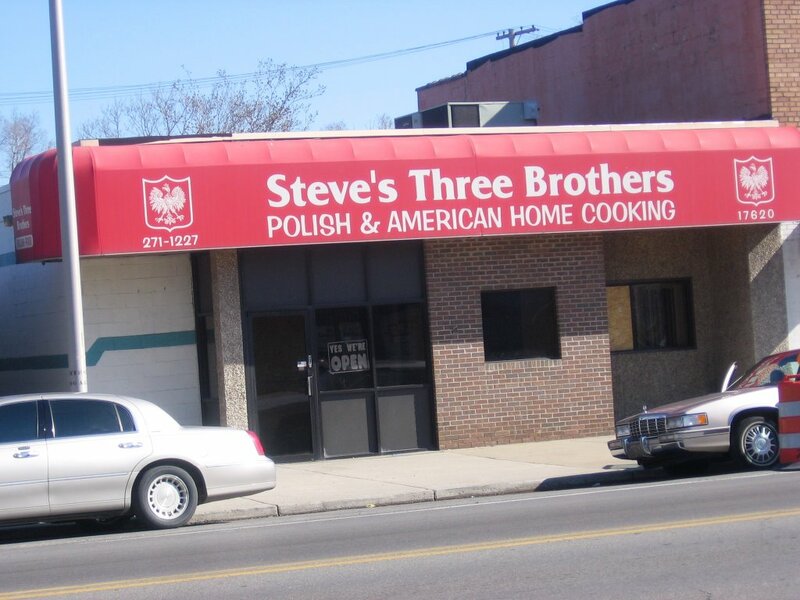 I mean, I've always known that Steve's Three Brothers serves up some good food. I remember my Mom and Dad taking me there as a kid. But to hear a pair of reporters from another city talk about it so highly still took me by suprise. Knowing that you've got a great restaurant in your backyard is one thing. But having a pair of reporters from another town tell you that it was "the greatest breakfast of our lives" just takes that sense of pride to a whole new level. I grabbed a copy of a photo that they took off of their web site. 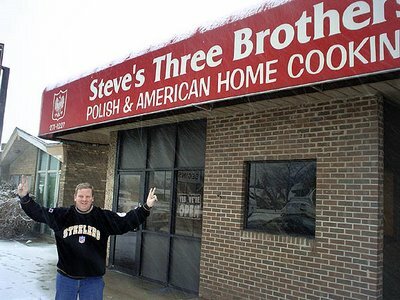 (That's Rich Rudek of the Post-Gazette posing in front of Steve's Three Brothers). Oh, and if anyone from the P-G finds this blog and is annoyed with me grabbing a photo from your site - just say the word and I'll remove it. I just want to say that Jeff Ivey and Rich Rudek are a wonderful additions to the Gazette. They arrive early, stay late, and venture into Pittsburgh's opposing cities with pride; all in the name of journalism. Jeff and Rich should be thanked for the "free advertising" for the breakfast place. I'm sure all Detroiters are proud to see the "neighborhood joint" get some respect. Tell the Pistons to get some good eats, they're going to need it against the CAVS!